The latest chain to put its name on the glittering marquee of Thor Equities building in the new Coney Island is Little Caesars Pizza. Over Memorial Day Weekend, there was a cart selling Little Caesars “Hot-n-Ready” $5.00 pizzas in front of Thor’s building at Surf and Stillwell. The price was right and they sold out. Afterwards, signs remained taped to the outside of the window advertising the food franchise. We wondered if it was a tryout by a franchisee or guerrilla marketing. The official sign for “Little Caesars Express” went up last week. The Detroit-based Little Caesars is the nation’s third largest pizza chain with over 35 locations in New York City. It joins Applebee’s, Dunkin Donuts, Subway, Rita’s Italian Ice, It’Sugar and Rainbow Shops in making Surf and Stillwell a new mecca for chains and franchises. What’s up with the vacant “ARCADE” next door? According to the Coney Island Rumor Mill, an arcade operator has agreed to fill the building’s two dummy arcades with games but paperwork issues are delaying the deal. No surprise there. Making a mockery of the zoning laws, the designated “arcades” have remained vacant ever since the building’s first tenant, Miami candy chain It’Sugar, opened last year. 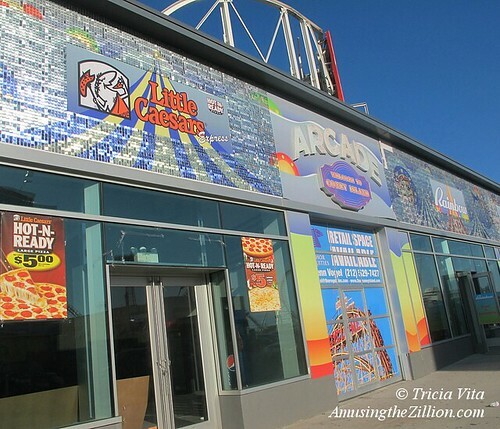 The 2009 Coney Island Rezoning requires the building to have a percentage of amusements equal to the square footage allocated for the arcades. If something other than amusements went into the space, the building’s C of O would be in jeopardy. Why doesn’t Thor CEO Joe Sitt just throw some arcade machines in the “arcades” and open them up to the public instead of taking advantage of what appears to be a loophole in the zoning law that allows the spaces to remain vacant? Based on Sitt’s eviction of amusements from his property (“Thor’s Coney Island: What Stillwell Looked Like Before Joe Sitt,” ATZ, March 3, 2010), it’s our opinion that he’s not in any hurry to replace them. The zoning states that “At least 15 percent of the Stillwell Avenue and West 10th Street street frontage of any zoning lot shall be occupied by Use Group A1 uses at the ground floor level.” Use Group “A1″ includes amusement arcades as well as open booths with games of skill or chance, such as water racing and shooting galleries, which used to occupy the spot in the demolished Henderson Building where the Brooklyn Nets Shop is now. 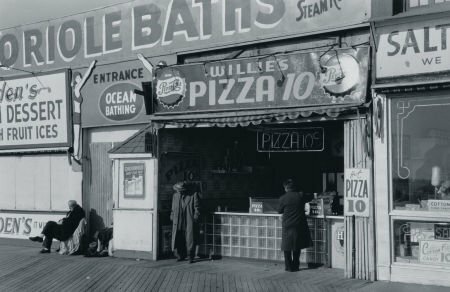 In 1950, the Coney Island Boardwalk was still lined with bathhouses featuring steam rooms and “sun parlors” and you could get a slice of pizza for 10 cents. The painted signs had big, bold typography designed to catch your eye and draw you in. This photo of Coney Island’s Oriole Baths (formerly at W 16th Street) and Willie’s Pizza taken in 1950 by George Daniell will be on the auction block at today’s sale at Heritage Auctions in New York. The gelatin silver print signed by the photographer is editioned 9/20 in pencil, and was printed in 1998 in association with Sarah Morthland Gallery and Vincent Cianni. The pre-sale estimate is $800-$1,200. Best known for his celebrity portraits of movie stars, artists and writers, George Daniell (1911-2002) also photographed shore scenes, including New York’s Hudson River, Fire Island and Coney Island. May 19, 2012: Paul’s Daughter & Ruby’s Bar Reopen on Saturday, Restored Signs to Return! Renovations are underway at Grimaldi’s Pizzeria, which expects to re-open its Sandy-damaged restaurant on Coney Island’s Surf Avenue in two weeks. “May 1st is my birthday,” Grimaldi’s operator Joe Silvestri told ATZ. “We’ll be open for my birthday.” Their pizza was a favorite of workers in the amusement area. 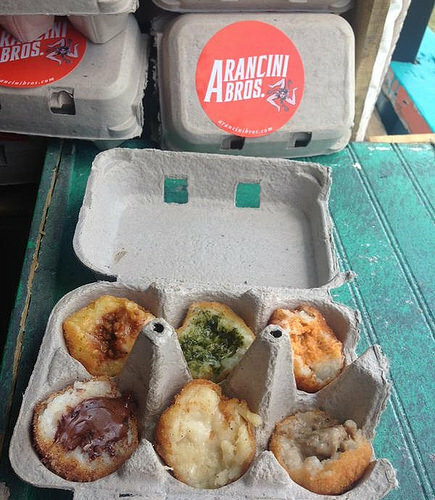 One of our very first takeout pies is pictured above. The Coney Island outpost of the famed Brooklyn Bridge pizzeria had been open only four months old when Superstorm Sandy struck. 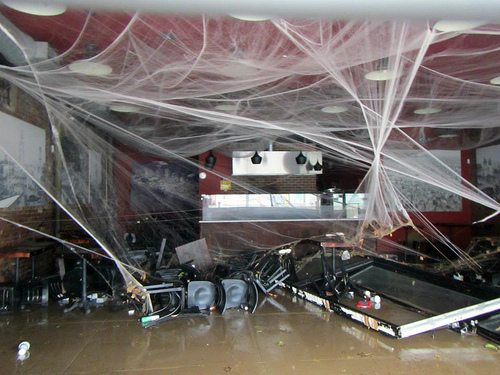 The restaurant’s metal gate gave way to Sandy and the interior of the pizzeria was wrecked by the wind and flood waters. The cobwebs in Jim McDonnell’s photo were part of the Halloween decor and look genuinely eerie. We dined at Grimaldi’s just two days before Sandy and can’t wait to welcome them back. Grimaldi’s reopened today! 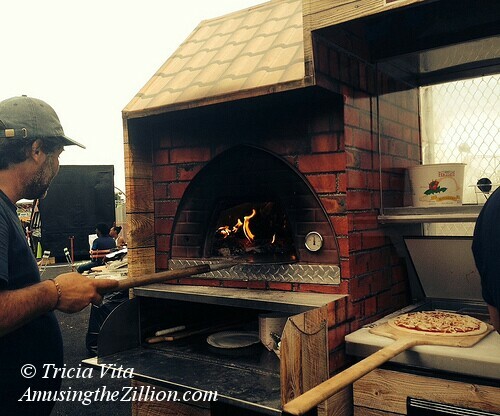 The pizzeria is currently hiring a pizza chef, waiters, kitchen help and bartender. They’re expecting their beer and liquor license to come through. Updates soon! 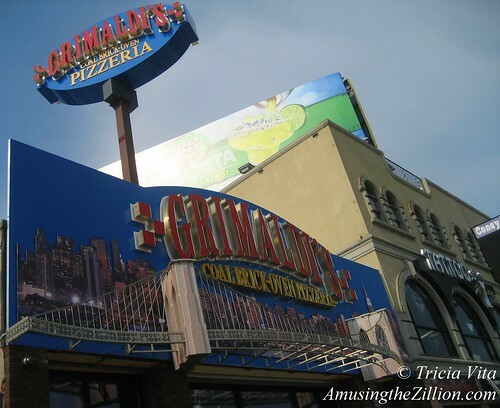 Yesterday, ATZ peeked inside the new Grimaldi’s Pizzeria on Surf Avenue in Coney Island to see what we could see. Workers inside said the restaurant was opening today! Today is of course Mermaid Parade Day and Surf Avenue will be thronged with tens of thousands of mer-people as well as folks watching the parade. 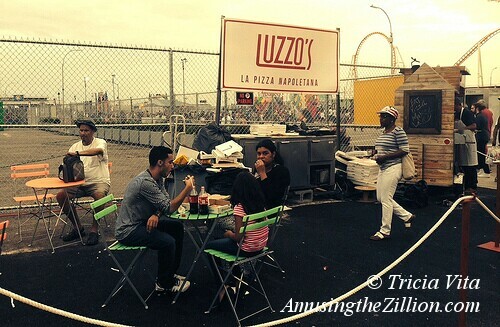 We predict a very busy first day in Coney Island for the famed Brooklyn pizzeria. Under construction for three months, Grimaldi’s is on the less traveled north side of Surf Avenue directly across from the Eldorado Skooters. Its sign is highly visible from the subway as well as the amusement area and should help attract customers. This week, a 3-D Brooklyn Bridge that lights up was hoisted by crane onto the sign’s New York City skyline. Inside the cavernous space, vintage photos of old Coney Island and the City’s rendering of the new Coney Island line the walls. Tables and chairs are set up and ready to welcome customers. Buon appetito, mermaids and mermen! Grimaldi’s is open. Buon appetito! 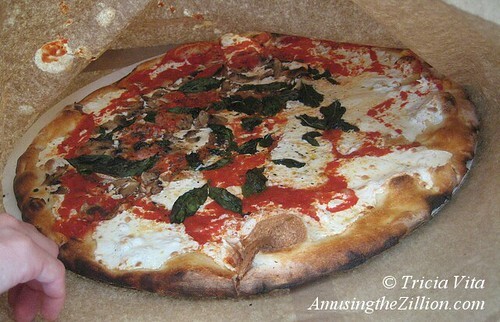 After opening on Mermaid Parade Weekend, the new Surf Avenue Grimaldi’s got its first review from Devour NYC, who called it “a great tasting pizza and for $14 for a large pie, it may be the best deal in Coney Island.” The reviewer said there was an hour wait, so we decided to try it today–a Thursday. But Grimaldi’s was closed and our Coney friends were wondering if it was only open on weekends for now. ATZ phoned Joe, Grimaldi’s General Manager, who said they were closed temporarily due to a permitting issue with the City, and expected to reopen on Friday, June 29, or by July 1st. The pizzeria will be open daily from 11:30am or 12 noon. The Coney Island location does not have a phone yet, but we’ll post an update as soon as possible after it reopens.